Dan Sarginson has spoken of his frustrations at not being able to give the NRL his “best shot”. The centre played just five games for the Gold Coast Titans before his season was cut short by a shoulder injury. With new coach Garth Brennan telling him he would struggle to break into his plans next year, he took up the option of leaving early to return to Wigan on a two-year deal. And while he is excited about getting back among familiar faces when he arrives tomorrow, he wished injuries hadn’t prevented him from having a better crack Down Under. “I think it got the better of me, to be honest – it’s a hard place to be when you’re injured and with people on your back,” he said. “I played my first five games with a knee injury, I really wasn’t at my best and that was hard because I couldn’t prove people wrong because I was playing with the injury. “Then my shoulder went in the Melbourne game and I just didn’t have another opportunity to prove people wrong. “That was the most frustrating thing, I didn’t get a chance to give it my best shot. “It still frustrates me but I can’t control anything that happened injury-wise, I’ve just got to focus on what I can control – and that’s next season at Wigan. Sarginson may also feel the need to win over the Wigan fans who questioned the decision to bring him back – the sixth frontline player to return from spells away under Shaun Wane’s watch. He is likely to be a replacement for Anthony Gelling. He returned to New Zealand when his girlfriend was injured in a car accident and is not expected to return. The Warriors published a graphic on social medial displaying Sarginson’s superb statistics in his final match - the 2016 Grand Final win - to illustrate what he can contribute to the side. “I’m not the most talented bloke but I’ll always give it absolutely everything,” said the versatile back. 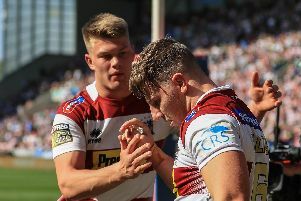 “I was chatting to Shaun Wane the other day and he mentioned Tom Davies and how he is such a competitor and how he’s seen a lot in Tom that he saw in me. Born in Perth, Australia but raised in London, Sarginson joined Wigan ahead of the 2014 campaign on a recommendation from Sam Tomkins, who had told Wane about how hard he had been to play against. He was recruited as a ‘project player’ but his determination in training caught his coach’s eye, and he earned an immediate starting spot. He was shortlisted for Super League’s Young Player of the Year at the end of his debut campaign, missing out to Daryl Clark, who also took the Steve Prescott Man of Steel prize. After two more years with Wigan, he signed with the Titans after attracting offers from Melbourne Storm and rugby union. Sarginson – who met with Warriors chairman Ian Lenagan when he went to the World Cup final in Brisbane - has already endeared himself to Wane by turning down the chance of a few days off to re-settle in the area. “I told him that I wanted to jump straight into it,” he said. “I want to get around the boys and get into the swing of it. I’ll see my family over Christmas and I’m really looking forward to that, but I want to get a good seven to 10 days in before then to make sure I’m raring to go in February. “I can’t wait to be back around the boys, I’ve obviously got some great memories from my time at Wigan and how successful we were in those three years.